Completed Automator workflow for opening apps, folders, and URLs. Screen shot courtesy of Coyote Moon, Inc.
Automator is an often overlooked utility that lets you build workflow assistants that can take repetitive tasks and automate them for you. 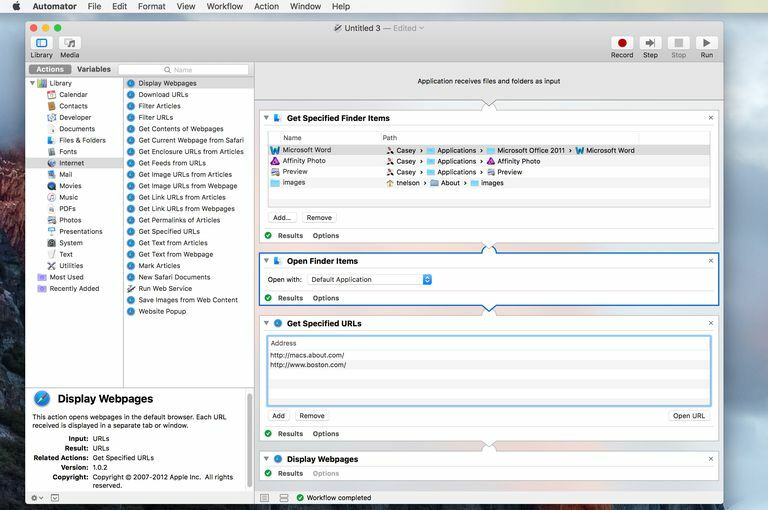 Of course, you don't have to use Automator only for complex or advance workflows—sometimes you just want to automate a simple task like opening your favorite apps and documents. You probably have specific work or play environments you use with your Mac. For instance, if you’re a graphic designer, you may always open Photoshop and Illustrator, plus a couple of graphics utilities. You may also keep some project folders open in the Finder. Likewise, if you're a photographer, you might always open Aperture and Photoshop, plus your favorite website for uploading images. Of course, opening applications and folders is a simple process; a few clicks here, a few clicks there, and you're ready to work. However, because these are tasks you repeat over and over, they're good candidates for a bit of workflow automation. In this step-by-step guide, we're going to show you how to use Apple’s Automator to built a program that will open your favorite applications—as well as any folders and web pages you frequently use—with just a single click. Automator: This app comes with your Mac. The instructions below are relevant for macOS High Sierra, but with a bit of tweaking, you can make it work for other versions of the Mac operating system, too. Applications: Compile a list of the applications you want to open automatically when you launch the program you'll create with Automator. Folders: If there are specific folders you work from on a regular basis, the application you create with Automator can open them in Finder windows. Open Automator, located at /Applications. Select Application in the window that pops up when you first open Automator. In some versions of Mac OS, you might need to first select New Document and then Application as the template type. In the Library list on the left of Automator, select Files & Folders. Locate Get Specified Finder Items in the middle panel and drag it to the panel on the right-hand side of Automator. You can also double-click it in place of dragging it. Click the Add... button to add an application or folder to the list of Finder items. Keep doing this until all the items you need for your workflow are present. Don't include your default browser (in my case, Safari) in the list of Finder items—we'll choose another workflow step to launch the browser to a specific URL. From the Library pane, drag the Open Finder Items to the workflow pane, below the previous action. This completes the part of the workflow that opens applications and folders. To have your browser open a specific URL when you run your program, continue on with the next step. Otherwise, to finish here, see the last section below on how to save and run the workflow. In the Library pane, select Internet. Drag the Get Specified URLs action to the workflow panel, below the previous action. This action will include Apple's home page as a URL to open—select the Apple URL and click the Remove button (unless, of course, you want that URL to open in your program). Click the Add button to attach a new item to the URL list. Double-click in the text box for the URL to change the URL to the website you want to open when you run your program. Repeat these steps for each additional URL you want to open automatically. When finished, return to the Library > Internet pane and drag Display Webpages to the workflow pane, just below the previous action. When you're finished creating your workflow, you can test it to make sure it actually functions correctly. To do this, click the Run button at the very top-right corner of Automator. Because we're creating an application, Automator will issue a warning about how it won't receive input when running inside Automator. You can safely ignore this warning by clicking the OK button. Automator will run the workflow. Check to be sure that all of the applications opened, as well as any folders you may have included. If you wanted to open your browser to a specific page, make sure the correct page loaded. Once you've confirmed that the workflow works as expected, you can save it as an application. Enter a name and location for your workflow application and click Save. With the .APP file created wherever you saved it, just double-click it to run the workflow. Because it works just like any other Mac application, you can also click and drag the workflow application to the Dock, or to a Finder window's sidebar or toolbar. If you're on-the-go, you can create workflows in the iOS Workflow app for your iPhone, iPad or Apple Watch.